Guatemala has a gang issue, and recently it has begun to affect people in my community. Violence is meted out with impunity here. Probably as a result of more than 15 years of brutal civil war in the 1980s and 1990s. Death and violence are looked upon as normal. Everyday the most popular daily paper Nuestro Diario’s front page is covered with tales of death and destruction. These stories don’t stop on the second page; they fill it from front to back. 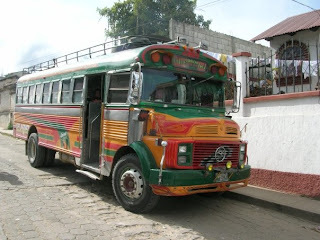 Gangs have been taxing the bus companies in Guatemala City since before I arrived here. If a bus company refuses to pay, gang members climb aboard their buses and shoot their drivers and ayudantes (assistants, people who collect fares and place luggage on top of the bus). More than 15 people have been killed as a result this January. Unfortunately, the income of a bus driver is too enticing for men who need to support their families. The high instances of death on the job do little to deter desperate people from applying to these positions. Until recently this problem was contained to buses traveling in and out of Guate, but a couple of weeks ago gang members started approaching bus drivers in Xela. My town’s buses were among those approached and given a choice: Q45,000 ($6000) or the lives of our bus drivers. Wanting to protect their own, the town’s bus companies pooled together and paid up. The saddest part behind all of this is the fear that is developing as a result. It has always been considered very calm and safe here in comparison to other parts of Guatemala, but now people are not so certain of their security. Rumors are flying that the gangs are going to “tax” the stores here. The police traveled up from Xela last week to meet with the town and discuss their options. Community watch groups have been formed and now patrol the streets at night. People are less trusting of their neighbors and won’t go out at night for fear of being associated with the gangs… or attacked by them. I am skeptical of the reach of the gangs in my town. I still feel safe here, as the bus companies paid up, I am not afraid to ride on the buses. It is sad however, to see the fear affecting my town. It’s unfortunate, but I feel it is only going to get worse.